In Professor Williamson’s Spring 2017 “Diversity in the City” course, fifteen students examined how cities have responded to diverse newcomers–ranging from the early twentieth century’s machine politics, through the Great Migration of African-Americans to northern cities, to the dispersion of contemporary immigrants since the late 1980s. But beyond learning about how these ideas are presented in history, in current federal policy, and in cities across the country, Williamson wanted her students to leave this course with a deeper practical understanding of how racial and ethnical diversity shapes the development of local policies. So, she got her students out of the classroom and into Hartford. 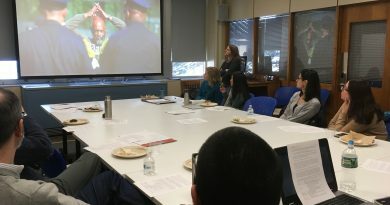 Toward that end, Williamson developed a Community Learning component of her course where students served as short-term research consultants for local organizations, such as Refugee Advocacy Services, the Asylum Hill Neighborhood Association, and the Hartford Commission on Refugee and Immigrant Affairs. Partnering with these groups, students worked to address current policy questions related to issues of diversity, including: refugee employment, non-citizen voting, and resource development for community members. Williamson set up this project so that her students were able to do the real work of policy research and analysis by gathering information about their organizations, interviewing local clients or volunteers, and visiting the site as well as researching pertinent policy and scholarly sources on the topic. 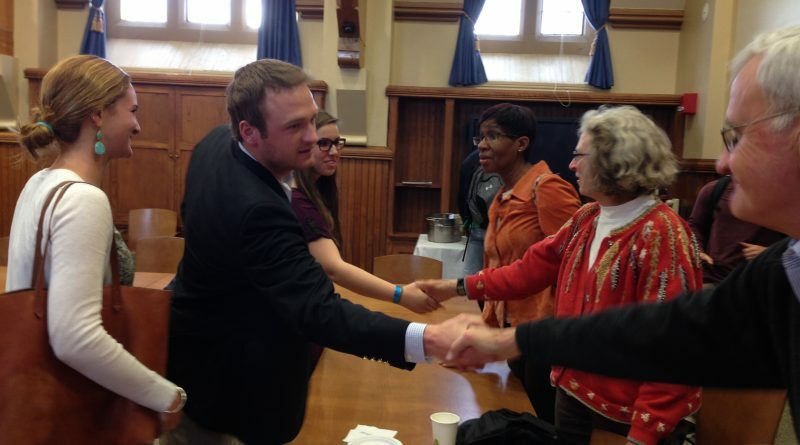 Students developed policy proposals based on the lived experiences of diverse communities in Hartford. Ultimately, they used their field research to create briefing presentations and policy memos, offering recommendations to address their community partners’ specific concerns and questions. Jennifer Cassidy, Co-Chair of the Asylum Hill Neighborhood Association (AHNA) Welcoming Committee, says that working with Williamson’s students was productive because “they had the capacity to do the legwork that we didn’t have to do, and they offer refreshing ideas.” AHNA serves as an umbrella organization that empowers residents and supports collaborations between stakeholders in their area. Their recent focus on assisting and engaging the neighborhood’s immigrants and refugees led them to create a multicultural resource corner, and Williamson’s students were able to help them by researching how they can improve on attracting immigrants to visit the resource corner, recommending a youth-focused engagement strategy including a youth advisory council. In “Diversity in the City,” Williamson’s students gained a real-world understanding of policy research and contribute to the surrounding Hartford community by doing specific work that local organizations may not have the time or resources to complete. Interested in developing a Community Learning component for your course like Williamson’s “Diversity in the City?” Contact Megan Hartline at the Community Learning Initiative for opportunities, resources, and feedback about this process.